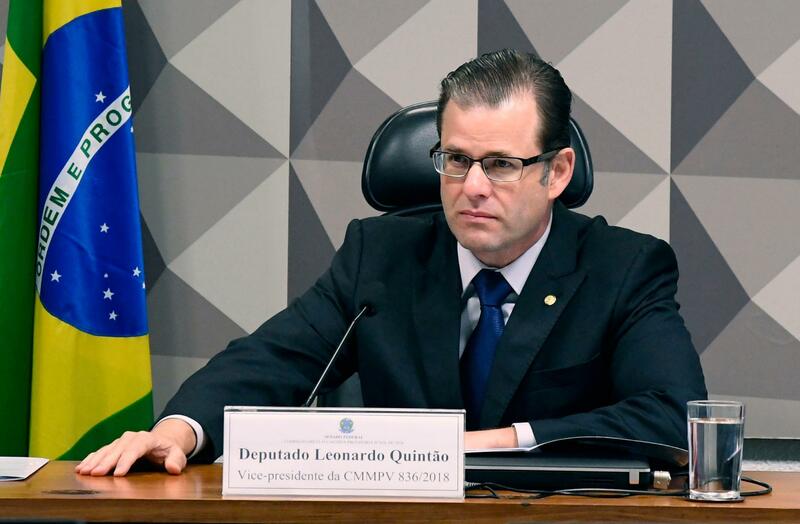 New Minister of Mines and Energy Admiral Bento Albuquerque announced on 4 March that he plans to permit mining on indigenous lands in Brazil, including within the Amazon. He also said that he intends to allow mining right up to Brazil’s borders, abolishing the current ban along a 150-kilometer (93-mile)-wide swath at the frontier. The Bolsonaro administration’s indigenous mining plan is in direct opposition to indigenous land rights as guaranteed under Brazil’s 1988 Constitution. The indigenous mining initiative will likely be implemented via a presidential decree, which will almost surely be reviewed, and possibly be rejected, by Brazil’s Supreme Court. Mining companies stand ready to move into indigenous reserves, if the measure goes forward. Brazil’s mining ministry has received 4,073 requests from mining companies and individuals for mining-related activities on indigenous land. Indigenous groups are outraged and they plan to resist in the courts and by whatever means possible. 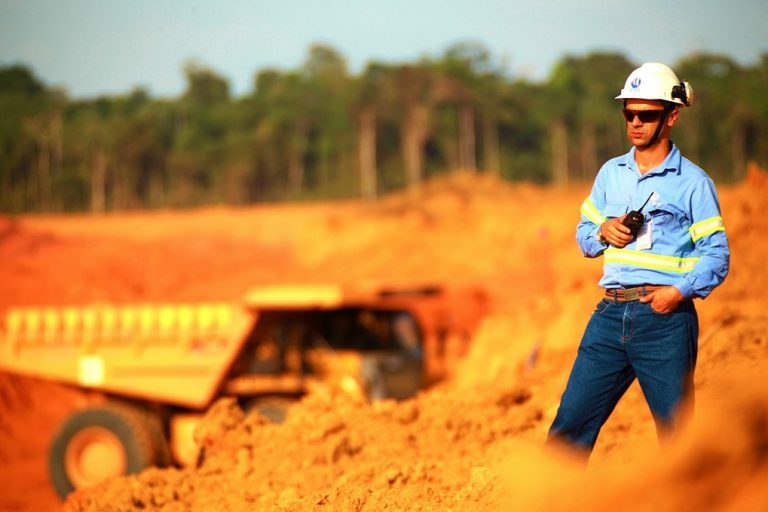 Brazil’s mining industry has a very poor safety and environmental record. As recently as January, Brazil mega-mining company Vale saw a tailings dam collapse at Brumadinho which killed 193 and left another 115 missing. Public outcry is strong against the industry currently, but how the public will respond to the indigenous mining plan isn’t yet known. An industrial mining operation in Brazil. Note the forest at the edge of the open pit mine. Photo credit: Norsk Hydro ASA via VisualHunt.com / CC BY-NC-SA. For many years, international and Brazilian mining companies have dreamed of getting access to the mineral wealth lying beneath indigenous lands. And finally, the government of Jair Bolsonaro seems determined to give them that opportunity. On 4 March, while Brazilians were distracted by Carnival celebrations, the new Minister of Mines and Energy Admiral Bento Albuquerque announced plans to permit mining on indigenous land. He also said that he intends to allow mining right up to Brazil’s borders, abolishing the current 150-kilometer (93-mile) wide mining buffer zone at the frontier. The minister said that current mining restrictions are outdated. The long-restricted indigenous and border areas “have become centers of conflict and illegal activities, that in no way contribute to sustainable development or to sovereignty and national security.” The administration will shortly be holding a nationwide consultation to discuss how the changes should be made, he concluded. 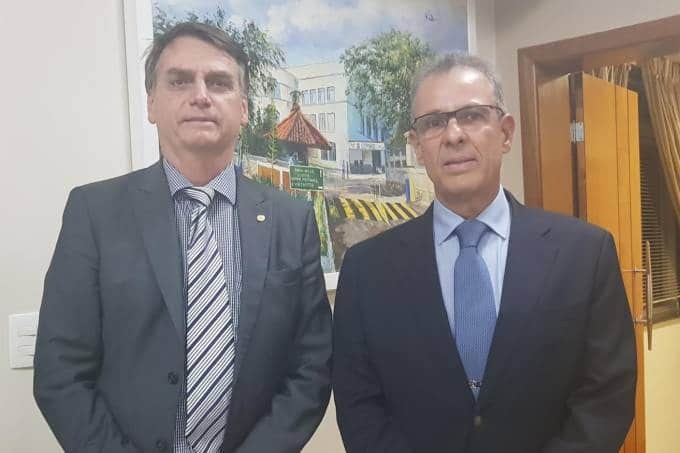 President Jair Bolsonaro (left) with new Minister of Mines and Energy Admiral Bento Albuquerque. Image found on Twitter. The minister’s announcement was not unexpected. President Jair Bolsonaro, an ex-army captain, has said that he admires the 1964-85 military dictatorship, and some are drawing parallels between Bolsonaro’s policies and theirs regarding indigenous and quilombola communities. Back in 1976, Maurício Rangel Reis, Interior Minister in the military government of General Ernesto Geisel, expressed harsh views toward indigenous peoples: “We plan to reduce the number of Indians from 220,000 to 20,000 in ten years,” he declared. But the military didn’t achieve this goal. Far from being eliminated, Brazil’s indigenous numbers increased to their current 900,000 population. Indigenous groups achieved real gains after the military government passed into history, and its dictatorial rule was supplanted by the progressive 1988 Brazilian constitution, which brought two important innovations. It abandoned the goal of assimilating indigenous people into the dominant culture (a goal Bolsonaro wants to reinstate), and it affirmed the concept of “original rights,” recognizing indigenous peoples as Brazil’s first inhabitants, with the right to remain on ancestral lands. Article 231 of the Constitution states: “Indians have the right to the permanent occupation of their traditional land and to enjoy the exclusive use of the wealth in the soil, rivers and lakes.” Moreover, their land rights are “inalienable.” The Constitution allows for mining on indigenous land, but only after the Indians have been consulted and specific procedures for doing so, approved by them, have been ratified by Congress. Mining industry and individual prospecting requests on indigenous land as filed with the federal government. Map by Mauricio Torres using data provided by the Departamento Nacional de Produção Mineral. Admiral Albuquerque’s recent announcement provided no clue as to how the Bolsonaro government could legally give indigenous groups a voice but no veto regarding use of their lands, while somehow staying within the letter of constitutional law. 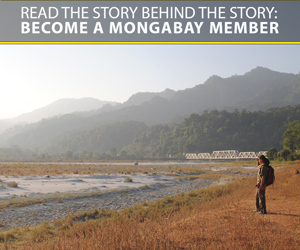 The Ministry of Mines and Energy has, however, confirmed to Mongabay that it plans to authorize mining on indigenous areas. 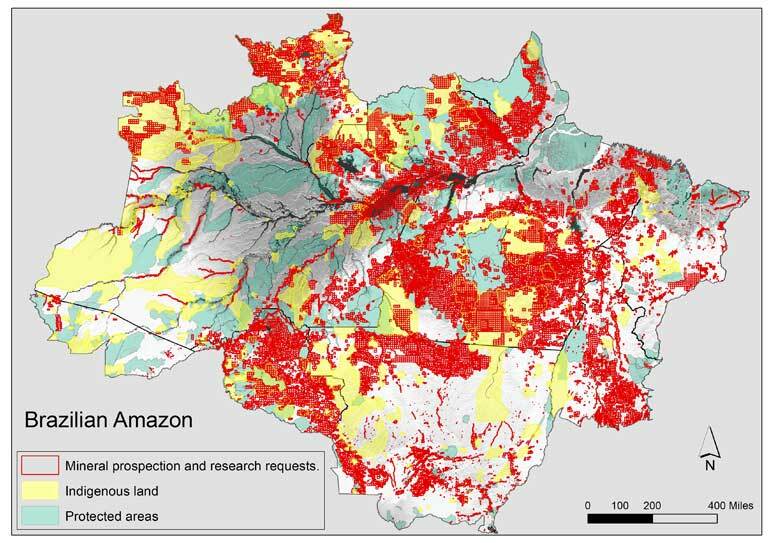 Though, as to the legal mechanisms for doing so, it would only say that “the specific regulatory model will be discussed with Congress and other involved parties.” Though its reports are unconfirmed, analysts suggest Bolsonaro will probably issue a presidential decree to allow mining, which is the approach he plans to use to permit agribusiness to lease land within indigenous reserves ­– a move that faces a similar constitutional roadblock. 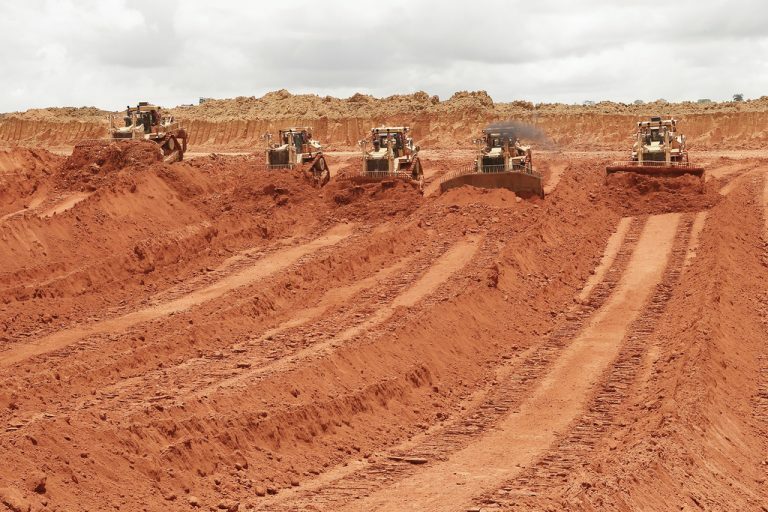 The Amazonas branch of the Federal Public Ministry (MPF), an independent group of federal and state litigators, is so concerned at Bolsonaro’s mining plan that in February it went to court to ask the National Mining Agency (Agência Nacional de Mineração, ANM), the federal body that administers the mining sector, to turn down all requests by international and Brazilian mining companies to prospect or mine on indigenous land. The mining industry has not only made prospecting requests (red) within indigenous reserves (yellow), but also on other conserved lands (green). Map by Mauricio Torres using data provided by the Departamento Nacional de Produção Mineral. Davi Kopenawa Yanomami, one of Brazil’s best-known indigenous leaders, says that large-scale mining by big companies is particularly harmful: “This kind of mining requires roads to transport the mineral, large areas to store production, big dormitories where workers can sleep. It will transform our forest.” A 2017 study found that mining and its auxiliary activities caused 10 percent of deforestation in the Brazilian Amazon between 2005 and 2015. 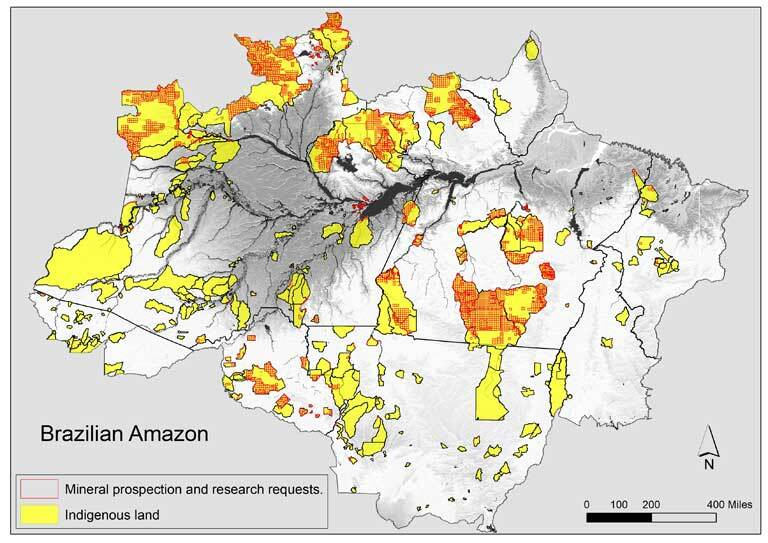 How much Amazon deforestation might skyrocket if indigenous reserves are opened to mining now is anyone’s guess; indigenous groups are currently the Amazon’s best land stewards. Federal Deputy Leonardo Quintao, a major backer of the mining industry. Image by Vinicius Loures / Agência Brasil. After last year’s election, the pro-mining lobby in Congress, known by some as the “mud lobby,” is stronger than ever. As of now, the new Mining Code has yet to be signed into law, and the horrific Vale mining disaster in Brumadinho this January, with 193 people dead and another 115 missing, might further delay approval. Andréa Zhouri, at the University of Minas Gerais, said the disaster stemmed from “politico-institutional failures,” particularly a lack in regular monitoring of hazardous mining operations. “The [value of] ore is above everything and everyone,” Zhouri said. Today, mining companies chomp at the bit, having registered many prospecting requests within indigenous reserves. Minister Albuquerque – an admiral with a long, illustrious military career, and known for getting what he wants – has signalled readiness to help those firms translate their plans into action. However, Brazil’s indigenous people, with a history of batting away threats, often against bad odds, are ready to fiercely resist. The lines are drawn for battle, likely in the courts, and potentially all across Brazil. Banner image: Truck being loaded with bauxite ore at Brazil’s Norsk Hydro ASA Paragominas mine. Mining is conducted today on a vast scale, and is already resulting in major deforestation in the Amazon. Photo credit: Norsk Hydro ASA via Visual Hunt / CC BY-NC-SA. Forest and topsoil must first be removed before ore can be accessed at Brazil’s Norsk Hydro ASA Paragominas open pit mine. Such industrial processes would be highly destructive of Brazil’s forests, indigenous reserves and cultures. Photo credit: Norsk Hydro ASA via VisualHunt / CC BY-NC-SA.